The clue to this event is in the name: Steady Eddy. 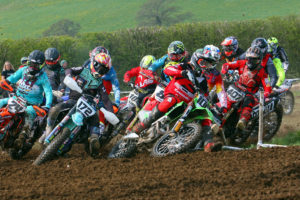 It was the first of a series of three events aimed at riders wishing to experience extreme enduro, but not too extreme! Paul Edmondson and his crew laid out possibly the longest course ever seen at Cowm Quarry near Whitworth, to accommodate the scores of riders eager to give extreme enduro a try alongside many other seasoned veterans of riding the tough stuff. By the end of the race there were few riders who would have agreed with the term ‘Steady’. The response to the series was terrific with over 160 entrants taking to the start line. With no Pro or Expert classes it was the Clubman riders who started first around the challenging Cowm course. many places so riders could get their confidence on the easy routes before testing out the tougher lines. Cowm is tough and very rocky with some serious hills and descents and although now as extreme as the ACU BEEC course there were plenty of spots where riders had to think twice before attempting them. The layout was tough right from the start as the course weaved its way around an endurocross style section with rocks, logs, tyres and a water filled tunnel to let everyone know there was to be no let up. For a handful of the quicker riders the lap was under 20-minutes but the majority took around 20-25 minutes to complete one circuit. With so many riders in the race the length of the course came into play and by the time the first riders completed the opening lap the field was well strung out. A few steep sections required the marshals to step in with assistance but thirty minutes into the two-and-a-half-hour race everything was running smoothly and the tricky sections became more manageable. rival but even such a talented rider as Harry had a few moments he will want to forget where a momentary lapse of concentration saw him on the deck. James Ford carved a second-place spot clear of the Clubman pack, 12-minutes behind Harry but six ahead of third placed Lee Hattersley as these three were the first home and the only riders to complete eight laps. Mathias Salin had a cr acking ride in the Youth class. He finished in 13th overall with only Clubman riders ahead of him and seven laps to his credit. Jacob Wilson took second in class with Richard Moorhouse third. All three were pretty strung out around the course so it was sheer determination to pass riders ahead of them that got them the top three places in the Youth class. Michael Rayson, followed by a sizeable number of fellow Vets who all put on a good show. James Palmer took the Sportsman class win and had a large advantage over second placed Chris Brown and Robert Crayston in third. This pair were very close throughout the race and finished within a minute of each other, both on seven laps. The Sportsman Vets attracted a terrific entry. Many of these riders have the skills and experience to tackle extreme stuff and this race gave them the opportunity. Andrew Mills took the class win with Dave Askham second just a handful of places behind. Neil Myers completed the line up in third spot just two places behind Askham overall. Fortieth overall was Aden Overend. He was the top Novice class rider and put in a great deal of effort to get out in front of a large pack of Novice riders and stay there until the end. Lewis Moore took second in class and Sam Porter third in what was a tough event for novice riders. Once again Paul Edmondson and his crew delivered as promised. Cowm’s John Whittle had put in hours of graft to get the course into shape and it was very enjoyable to ride and to spectate. The race wasn’t the fastest ever held at Cowm, it was more of a grind-it-out type of challenge for many entrants but for those who could ride the never-ending sections it was a cracking outing. The level of the challenges was spot on and for the riders who liked Cowm Quarry, they are in for a treat at the second round which is at H2O.